Is there a plastic monster living in my fridge ? Does your fridge consume mounds of plastic on a weekly basis ? I was all lined up to chat about something else this week but as I was unpacking my weekly shop this thought sprung into my head …… “is my fridge turning into a plastic loving monster ?” Well you may be thinking why that thought ? but as I got stuck in to unpacking all my food the pile of packaging rubbish on the floor was growing before my eyes. Now I know that we are all way more aware of our plastic consumption than we used to be, right ? and I am not going to give you lovelies a lecture as I am sure many of you out there like to do your bit by taking reuseable bags to the supermarket, recycling glass bottles and clothes, compost food waste etc. in the hope that we can made a impact in a small way, don’t we. 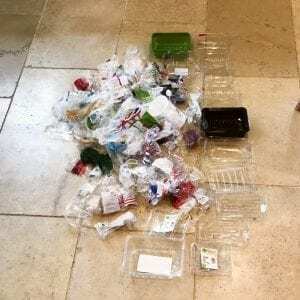 Why do the supermarkets still package every item we buy on a weekly basis in plastic ? I know they say they are doing their bit and making huge changes by introducing recyclable materials but just look at this picture here of the plastic I came home with this week alone and so we feed the plastic monster that continues to live in our fridge and recycle bins. How do you do your bit for recycling I would love to know ? I did try to make a stand several years ago by taking off all the plastic wrapping that my food came in and left it at the check out of my local supermarket, but you can imagine that didn’t go down too well and I was asked to take it home with me. There reasoning was that as I had brought the food in that wrapper, so that wrapper was now mine to dispose of. I left with the plastic in tow, with smoke coming out of my ears, the level of my rage was like an inferno and I made a silent promise to myself not to shop there again until things had changed but still very little has moved on and I don’t know about you but I find it harder and harder to consume less plastic. For several years I consistently went to my local market every week to get my fruit and veg but being a family of 5 (almost full sized adults!) I physically couldn’t drag back all my food to the car as the weight was too enormous added to which although the airmiles may be reduced on the fruit and veg at your local market you have no idea whether the food has been sprayed with pesticides and other chemicals, and organic.. who knows ? I have begged home delivery services to bring my food without carrier bags but one company (who will remain nameless) insisted my food had to be delivered to me in bags but they would take the bags back next time around and refund me for the price of the carrier bags – clearly they were not listening when I kept saying “but I don’t want the plastic in the first place”. Next I tried several bins to different types of rubbish and waste. I thought I was on to a winner here until I found out that my local authority actually didn’t recycle nearly as much as I thought they would and if there was one item in my huge blue recycling bin outside which was dirty or unsuitable then the whole lot would go to landfill – back to square one again.. There really doesn’t seem to be an answer so I am sorry if you have read this far and find there is no solution at the end of my rambling but here’s the thing, if we don’t all talk about these issues and swap ideas of how we can make small changes in each and every one of our kitchens I fear we may be drowning in plastic before we know it. So, please do leave a comment letting us know how you do your bit for recycling so we can share everyone’s great habits around. Cos if we each manage to gain a small win, imagine the impact on a massive scale and we can all say goodbye to the plastic monster living in our fridges ! P.S. announcements about my natural beauty products which are ready and waiting for you lovelies, coming up next week as well as a few natural beauty recipes to try too !